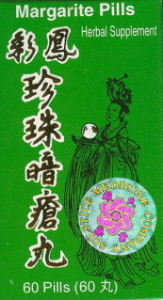 Margarite Pills are a pearl-based formula that is excellent for adolescent or adult acne. Also good for skin conditions with symptoms of itching and rashes including hives. Pearls are said to improve the luster and beauty of the skin. Best if used for several weeks. Take 4-5 pills up to three times a day. Do not use if pregnant. Containes: Pearls, Lonicera, Taraxacum, Glehnia, Rehmannia, Scrophularia, Rhubarb, Ganoderma. The formula above is very similar in action and effect. Other ingredients: cornstarch and water. Dosage: 6 pills twice a day.